Environmental responsibility doesn’t stop at the recycling bin. 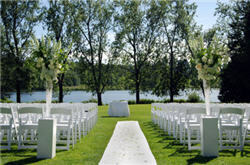 Now a day, even the wedding industry has more consumers opting for eco-friendly ceremonies down the aisle. The wedding industry generates a hefty sum of revenue each year – mostly toward disposable products. The average U.S. wedding cost more than $24,000 in 2010, according to The Wedding Report, a research company that tracks and forecasts wedding figures, revenue and consumer trends for the industry. Despite the lavish price tag, splurging on a dream wedding doesn’t have to mean neglecting environmental responsibility. Outdoors atop the green mountainside of upstate New York, Kate Harrison and Barry Muchnik recited vows in a central location; easily commutable for their 100+ guests. Harrison walked down the tree-encased aisle dressed in a recycled off-white gown and eBay purchased [recycled] Vera Wang heels; holding a bouquet of locally grown flowers toward Muchnik sporting his own suit. The two recited their vows as each placed rings made out of recycled metals on the other’s left hand. After the ceremony, the couple and guests dined at a nearby golf club, known for its locally grown, organic cuisine. Photographers snapped digital-only photos. After the celebration, the couple rewarded guests with carbon offsets as parting gifts and enjoyed a local honeymoon [as opposed to distant getaway involving airplane carbon emissions] in Vermont. Armed with a passion for the environment, the couple met in an environmental graduate program at Yale. Harrison holds an environmental law degree and Muchnik holds a Ph.D. in environmental history. The two wanted to not only go green because it would minimize their carbon footprint, it represented their connection. Harrison, author of the much lauded 2008 book, The Green Bride Guide: How to Plan an Earth-Friendly Wedding on a Budget, wrote the book as she was struggling to plan her own nuptials in 2007 – a time when green weddings were still relatively new to the marketplace. “It wasn’t until we started planning our wedding that we realized how hard it was to go green,” Harrison said. The struggle to find eco-friendly elements prompted Harrison to document her green adventures in The Green Bride Guide for future eco-conscious brides-to-be. The book provides resources for planning a green wedding all organized by price, style and budget – complete with worksheets. The concept of going green on your wedding day is often pictured as a natural, rustic event lacking personality. In an industry raking in more than $70 billion a year, incorporating green elements doesn’t have to mean compromising style or substance or going cheap – granted a green wedding can save consumers roughly 20 percent or more monetarily, according to Harrison – the issue is about negating harmful ecological effects. Couples can enjoy dream weddings all while incorporating environmentally conscious elements into the day. Harrison, as an eco-friendly bride, learned that the best way to plan a green wedding is by asking questions – does this have an environmental impact and is this needed. “[Asking questions] will dictate a lot and really will cut out a lot of the disposable extras that you really don’t need and won’t affect the quality of your wedding at the end of the day and only saves you money,” Harrison said. Wedding coordinator Ashley Paz, owner of Vera Green Weddings in Fort Worth, Texas, describes eco-friendly weddings as a process. Paz directs clients to local vendors. Environmental and social impacts go hand-in-hand and consumers should choose wisely when weighing between flying in flowers for the day or enlist the services of a local florist. Paz insists that it all comes down to supply and demand – if more people ask for eco-friendly product, more vendors will supply them. Not every wedding will be 100 percent emission-free, but balance is key. The average wedding produces 62 tons of carbon emissions and 400-600 lbs. of garbage, according to The Green Bride Guide. All of which can be avoided with creativity and guidance. Couples in 2010 were still eliminating non-essentials and employing new bargaining techniques to remain on budget, according to The Wedding Report. By opting for fair trade, local products and environmentally friendly goods and services, couples can not only help the environment, but also green businesses. Kate Fewings, founder of London-based Ethical Weddings, an online wedding magazine, encourages people to be more aware of their environmental responsibilities every day. Green weddings are just one way members of society can extend their impact on the world. Fewings founded Ethical Weddings on the basis that all environmental issues are important social issues and carry weight. Behind every wedding ring or hand-sewn dress is a person or group working to earn a living, so Fewings decided environmental issues should be considered ethical as they unknowingly affect others. The ethics behind environmental responsiblity drives Fewings to make waves in an industry known for wasteful consumption. “It really comes down to examining each aspect of an event and think about how you can do it in a more environmentally sensitive way,” Fewings said. Any event can incorporate eco-friendly elements. The wedding industry is a profitable market that offers opportunity for environmental improvement, but so does the average corporate Christmas party or dining event.